Firefighters and investigators inspect the crash site at the Pentagon. Yesterday terrorists attacked both the Pentagon and World Trade Center killing untold thousands of innocent Americans in the worst attack on American soil since Pearl Harbor. 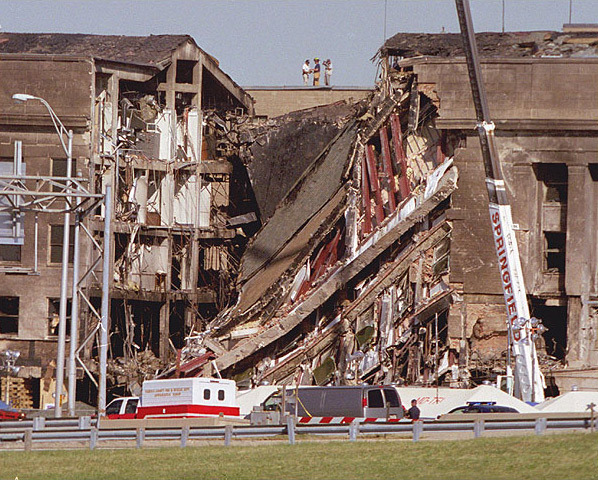 September 12, 2001 - Firefighters and investigators inspect the crash site at the Pentagon. Yesterday terrorists attacked both the Pentagon and World Trade Center killing untold thousands of innocent Americans in the worst attack on American soil since Pearl Harbor.